Last week the architect of Berlin’s Hauptbahnhof won in a legal dispute regarding the design of the station’s ceiling. 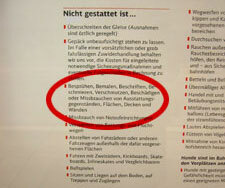 Deutsche Bahn didn’t use von Gerkan’s design claiming it was too expensive and too imaginitive. A cheaper, more boring solution was installed instead, von Gerkan sued, and von Gerkan won. More details here at Bloomberg. I would like to note that fishing around in the rubbish bins is also prohibited, so don’t even think about going back for that mistakenly dumped newspaper.